Hard disk is a kind of storage that uses a concentric stack of disks or "platters" to record data. It is a block device, that says it reads and writes data in fixed-size blocks. Generally, the block size is 512 bytes. So from a software engineer's point of view, a hard disk is just a sequence of continuous blocks of data, and you can visit any of them freely using some kind of address mechanism. Holds a disk's primary partition table. Holds the bootstrapping code. After BIOS initializing the PC, it will load this sector into memory and pass execution to it. Disk signature is used to uniquely indentify the boot disk by the OS and further by userland processes. But after the introduction of EDD, disk signature can be omitted and code areacan be extended to a length of 446. By convention, there are exactly four primary partition table entries in the MBR Partition Table scheme. Both the partition length and partition start address are stored as 32-bit quantities. Because the block size is 512 bytes, this implies that neither the maximum size of a partition nor the maximum start address (both in bytes) can exceed 2^32 * 512 bytes, or 2 TiB. See Partition Table, for more info. Cylinder-head-sector, also known as CHS, was an early method for giving addresses to each physical block of data on a hard disk drive. Though CHS values no longer have a direct physical relationship to the data stored on disks, pseudo CHS values (which can be translated by disk electronics or software) are still being used by many utility programs. Head: Data is written to or read from a platter of the hard disk by a device called head. Usually, two heads are used to manipulate the data on both surfaces of a platter. Track, Sylinder: A platter surface is composed of concentric circles. They are called tracks. All information stored on a hard disk is recorded in tracks. The tracks are numbered, starting from 0, starting at the outside of the platter and increasing as you go in. All tracks that have the same number and span across each platter surface form a sylinder. Sector: A track is divided into sectors that are the base units managed by a hard disk driver. In earlier hard drive designs, the number of sectors per track was fixed and because the outer tracks on a platter have a larger circumference than the inner tracks, space on the outer tracks was wasted. The number of sectors that would fit on the innermost track constrained the number of sectors per track for the entire platter. However, many of today's advanced drives use a formatting technique called Multiple Zone Recording to pack more data onto the surface of the disk. Multiple Zone Recording allows the number of sectors per track to be adjusted so more sectors are stored on the larger, outer tracks. By dividing the outer tracks into more sectors, data can be packed uniformly throughout the surface of a platter, disk surface is used more efficiently, and higher capacities can be achieved with fewer platters. Not only is effective storage capacity increased by as much as 25 percent with Multiple Zone Recording, but the disk-to-buffer transfer rate also is boosted. With more bytes per track data in the outer zones is read at a faster rate. However, as I metioned before, CHS values no longer have a direct physical relationship to the data stored on disks, the pseudo CHS still uses a uniform schema. The total length of CHS is 24 bits. Below is the detailed limit. See Partition Table. Logical block addressing (LBA) is a common scheme used for specifying the location of blocks of data stored on computer storage devices, generally secondary storage systems such as hard disks. The term LBA can mean either the address or the block to which it refers. Logical blocks in modern computer systems are typically 512 or 1024 bytes each. ISO 9660 CDs (and images of them) use 2048-byte blocks. LBA is a particularly simple addressing scheme; blocks are located by an index, with the first block being LBA=0, the second LBA=1, and so on. As described before, the partition table in MBR can hold at most four records. Each partion can't exceed 2 TiB. To alleviat this capacity limitation, an new partition schema called GUID Partition Table (GPT) is introduced in industry. See more at UEFI. Most of the time, LBA is used to find a partition. But specification says: if a partition's start block or end block or both are under the 8.4 GB limitation, CHS address should also be correctly record. Otherwise, CHS fields have some kind of default values. Partition type is used to label the file system used on this partition. For example, the code for linux ext2 is 0x83 and linux swap is 0x82. You can see a list of partition types by sfdisk -T. A hard disk can have at most four primary partitions for there are only four entries in the primary partition table. The following figure gives an example of a hard disk holding two primary partitions. The address mode used in figure is LBA. In CHS dialect, it should be Sector 1 - Sector 63. The first partition normally starts at sector 63 (LBA), that is just after the first track. The first 63 sectors (first track) can be used for other purpose such as holding bootloader code. Partition can start and end at any places as soon as there are no overlappings. And may not cover all the space on a hard disk. To get more partitions, we can subpartition a primary partition into several logical partitions. The primary partition used to house the logical partitions is called an extended partition and it has its own file system type (0x05 extended type). See more at Extended partition. As we mentioned in Hard Disk, a hard disk can have at most four primary partitions. If we want more partitions, we can change one primary partition into an extended one by subdividing it into logic ones and setting the partition type to 0x5 (extended type). Like Master Boot Record (MBR) describing a hard disk, a Extended Boot Record (EBR) is used for a logic partition. However, there is one EBR for each logic partition and all the logic partitions in a extended partition is linked one by one using two partition table records in MBR. 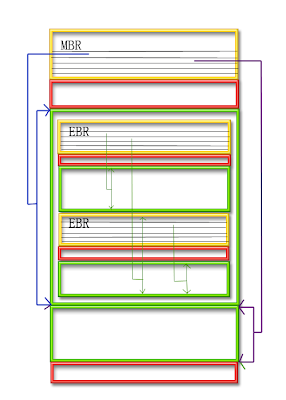 EBRs have essentially the same structure as the MBR; except only the first two entries of the partition table are supposed to be used. Starting Sector = relative offset between this EBR sector and the first sector of the logical partition This will be the same value for each EBR on the same hard disk; usually 63. The following figure gives an example of a hard disk holding an extended partition and a primary partition. There are two logic partitions in the extended partition. Now that we're ready, let's start it up! Now let's try to read and write some data using the command line client. Started Cassandra servers and tested successfully using the set …/get Keyspace1.Standard1['jsmith'] example. I was able to connect to both hosts via cassandra-cli and see the results created on just one node. I was able to create data on the second node and view on the first node. 6. Configure DNS and WINS addresses. 3. Now set the DNS Servers one at a time with the followind command. For each DNS server, increase the index number.